Sharp Corp. on Wednesday unveiled a new line of large televisions for the domestic market that feature liquid crystal display panels. The six models, sold under Sharp’s Aquos brand, are part of the company’s bid to shift to a growing and more profitable larger LCD market. The Aquos TV G series includes an 80-inch LCD TV, the largest on the domestic market, which Sharp expects to be priced at around ¥950,000. 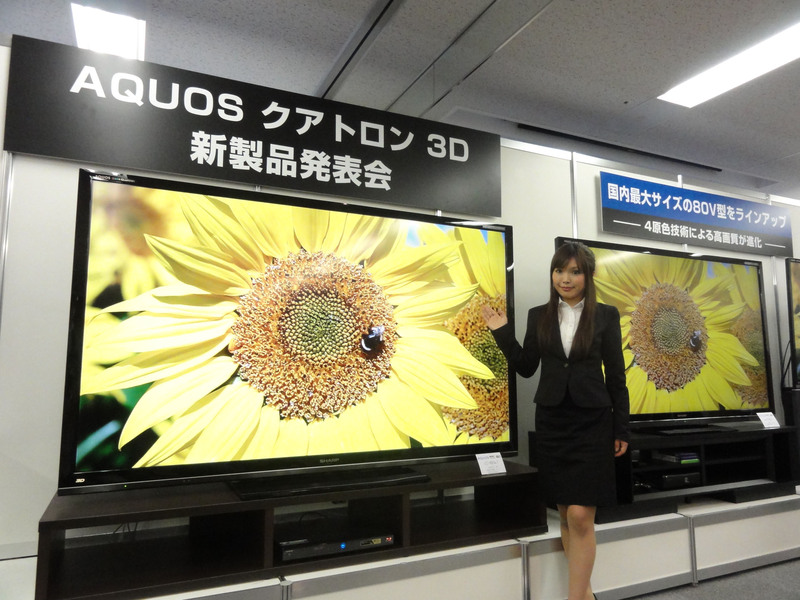 A smaller 60-inch model will be available for around ¥350,000. TVs with display panels larger than 60 inches accounted only for 0.8 percent of the domestic LCD TV market sales in June 2011. However, the market share of large TVs surged to 6.1 percent in December, which “shows the need for big displays,” said Shinsuke Yamamoto, deputy general manager of Sharp’s LCD digital product division for the Japanese market. “Based on two key words — big and smart — we’d like to provide new ways of enjoying TVs through our products in fiscal 2012,” Yamamoto said. Large-display TVs produce more realistic and expressive images, while the new models have “smart” functions that allow users to browse the Internet and use application software such as Skype and Facebook without being connected to any personal computer, he said. The new models can also provide a recommended list of TV programs and online videos based on past viewing records. Domestic TV manufacturers have been forced to reduce retail prices due to declining sales, with 30- to 40-inch models in particular feeling the crunch. International rivals such Samsung and LG have squeezed their share of global markets further. The new Aquos TV G series — 40, 46, 52, 60, 70 and 80 inches — is expected to hit stores in June. They are all 3-D compatible, and offer improved images and sound capabilities through large-scale integration systems compared to previous models. Last June, Sharp said it will focus on big TVs and LCDs for smartphones and tablet devices.